Decertor originates from Lima, Peru. Although he is not globally well-know at this stage I think that’s likely to change in the coming years. Decertor blends a broad palette of vivid colours on his large murals and illegal street pieces, taking some influence from national fabrics. His lifelike characters often have stone-faced looks. 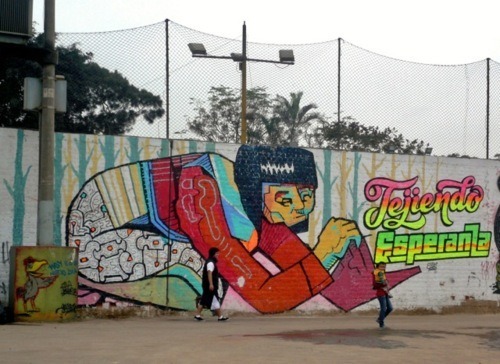 Perhaps that’s no surprise given Decertor started out painting tribute murals for murdered gang members in rough neighbourhoods of Lima. 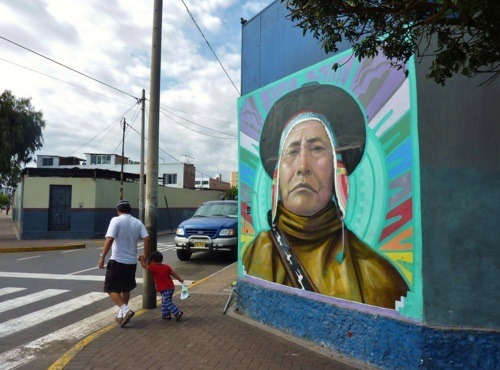 I’m confident you’ll see his work and name spread across South America and then beyond, as part of a generation of talented new South American muralists. In my case, during an important time when I made decisions about my future I opted to leave behind formality, friends and the life I had to pursue a different set of challenges, one of which was making street art. You see, in 2005 I was looking to go to art school but I became distracted. I was already painting a lot and the act of physically painting walls distracted me from formal education. All I wanted to do was paint. 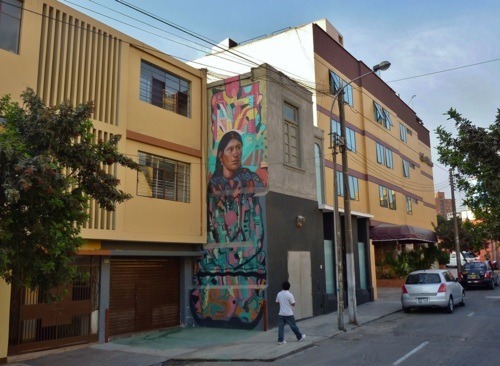 I didn’t care what I was painting and I didn’t know anything about the street art movement / scene in Lima. I maintain principally a figurative language [i.e. painting people], but for me the paint itself has stopped being only a “painting for the street”. I started to understand it as part of the urban landscape, like a unit which is part of the composition of the whole. Since then my work has grown in size and format. I had to find new ways to overcome technical problems like using spraycans strapped to the end of long poles. Something that is very present in my work is ‘man’, in whatever situation. We are the architects of society. I try to communicate this through my murals, and hope that most people recognize it (although at the same time there can be different interpretations). I try to critique everyday situations which are problematic, but always with irony. Another important theme I work with is to reassess the identity and customs that we have in common as a community. The idea is to always have an excuse to keep painting, to transgress, to counterbalance the publicity that encourages constant consumption, bad architecture and to return public spaces to the people. There was a time when I studied the geometry, deities and colours that show up in a lot of the Pre-Colombian cultures, especially in ceramics and textiles. I learned to recognize how to add these forms to my walls in a very intuitive way. Peruvian folklore is really varied. On occassion I have taken elements from the Paucartambo festival (Cusco), La Huaconada festival (Huancayo) and La Tunantada (Jauja). Usually the elements I borrow are masks of characters which satirise the colonisers. 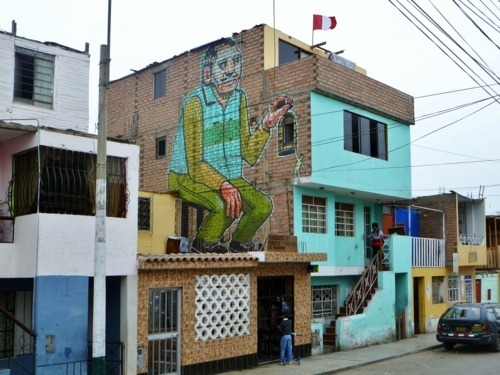 Lima is a chaotic and disorderly city with abysmal levels of social inequality and bad urban planning. There is a lot of space for graffiti and every day there are more and more adventurous writers and groups in all different parts of the city. The same can’t be said for murals, which usually have to be legal. 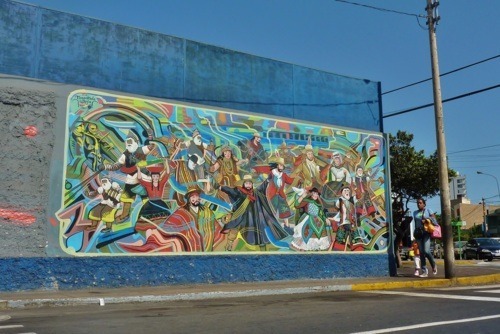 Local municipalities put obstacles in your way as people are scared of something new and they associate murals with power groups and propaganda. There is definitely a lot of artistic potential and there have been festivals which have made the practice more mainstream. The movement is growing, but always with Lima at the centre. Peru is centralized which is why Afuera (street art festival in a remote mining community in the Andes, www.afuera.com) is so important. It’s time to decentralize art and take it to remote, unexpected locations. In each society, art represents what is taking place there and the art is a consequence of that. 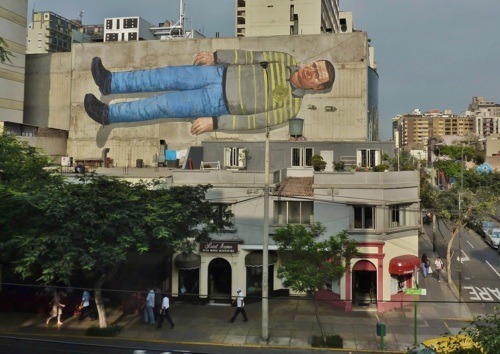 Street art in Lima has a very marked social agenda, thanks to a lot of factors one of which is immigration. As an immigrant to Lima your customs adapt to the new context, become deformed or are simply lost all together. There is a huge alienation, a struggle just to survive and every day all you can do is keep looking ahead, feeling foreign in the space that you inhabit. Add to that, poverty and social inequality and it’s a tough situation. At the moment in Peru there is a growth in cultural pride. We are looking inwards at our culture, to all that we have and all that we have inherited. 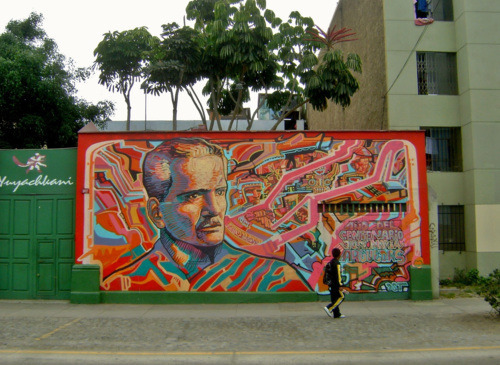 Street art in Lima is a bridge to this re-evaluation and reunion with our cultural identity. I thought that artists and friends were mostly the ones who were following my work, but after being invited to participate in some festivals and other projects, people in the street are starting to recognize my work, which is important. As far as the authorities go, it’s still complicated but I still manage to occasionally get things done. It’s not easy, just like I’m sure it’s not easy in any other city! I have a project with Elliot Túpac, in which we unite our work in one solid space without losing the particularities of our individual styles, which are very different. I always put off the idea of having an exhibition, and it looks likely to stay that way. I am really happy doing murals and each time on a larger scale, in different places, decentralizing this activity. I’m also interested in working with more enduring materials and modifying structures. Cerro de Pasco is a city devastated by man’s own hand. It’s a remote mining community way up in the Andes. The landscape is very harsh and the community is full of social and environmental problems caused by the very industry the town lives from. So, this is the setting for Afuera. The idea is that they will take a group of International and local artists to a place they would never normal have access to or even know about. Obviously, in a project like this, the community plays a big part. As artists, we want to go there and see for ourselves the complexities of the situation of living in a remote mining village and hopefully start a dialogue that activates ideas about inclusivity and decentralization. I think that projects like Afuera are really valuable ways of broadening the conversation about our identity as a culture and our identity as a global community. Afuera is an independent project which guaranties that neither the artists nor the works will be censored or influenced by any outside force, which is a difficult thing to pull off especially when powerful mining companies are involved. The organizers are trying to make the project happen with sponsorship and voluntary donations via Kickstarter. It is an amazing thing to bring together all of these people and some of the best street artists at this critical point in the history of Peru. Anyone who wants to support the project should visit the Afuera Kickstarter page (see below).